I know everything around us is rushing towards fall right now, but if you ask me, this is the time I enjoy summer the most. It's finally cooling down enough to be outside but we still have those much-cherished extra hours of daylight. In my opinion, this is when summer starts to get good. These lists are an ode to my favorite summer movie growing up, Now and Then. Between the small-town 60s-70s charm and the awkward navigation of coming-of-age relationships, there was a little something for everyone in our household to relate to and love. I love to see modern technology done in a retro fashion, like the Fujifilm Instax Mini and the Crosley Bluetooth record player (which, by the way, is VELVET!). The Madewell denim wrap dress can work in the heat now but could be even cuter come fall layered over a turtleneck and flares. The same goes for the ASOS mules, which, though it can be a polarizing choice, would be great worn with chunky socks as the temperatures drop. If you don't believe me, I'd like to present the court with exhibits A and B. A gold script necklace from Ryan Porter, a pair of retro glam Warby Parker sunglasses, and some adorable Madewell patches are style classics that you can wear year-round. A road-trip-inspiring print from Dean Martindale and a blush Reema floor cushion add some laid-back, retro style to your home. Pop a bell on this darling city cruiser bike from Six Three Zero and you're practically Christina Ricci herself. And even my candy obsession, Haribo gummies, give a nod to the era in a classic cola flavor. I've been listening to this playlist all week and it just makes me so happy. It's a mix a classic feel-good 60s and 70s songs mixed with some more modern artists that share the nostalgic retro vibe. These songs are all upbeat and uplifting. In my opinion, it's the perfect playlist for a barbecue, pool party, or any other party where there would be a wide range of ages in attendance. You can follow the playlist on Spotify or click to listen below. What was your favorite movie growing up? No one has ever accused me of being a minimalist, but lately, I'm finding myself drawn towards this very simple color palette of black and white with pops of gold and natural materials. Add in some opulent, scrolling Baroque focal points, like a large gilded mirror or an artful lighting fixture, and I'm completely smitten. An over-the-top Baroque piece in an otherwise minimalist space is the stuff très chic dreams are made of. Are you feeling these Baroque vibes? I know I'm coming in at the tail end of the parade on this one, but it has been a long time since a movie has moved me as much as La La Land. I saw it with my family back in January, and I loved it so much that I asked Zach to take me again for Valentine's Day. I know for me the emotional connection comes in part from how much I relate to the wear-and-tear of pursuing an artistic career, all the highs and lows, the triumphs and endless self-doubt. But what really made my heart ache was simply how gorgeous all of it was. Even though La La Land missed out on winning Best Picture (in case you hadn't heard), I was so happy to see it win for Best Production Design. The costumes bursting with Old Hollywood style references, the mixed pattern quirkiness of Mia's apartment, and the intense Technicolor palette all woven perfectly into modern day created a style that is at once breathtakingly timeless and entirely new. What was your favorite part of La La Land: the costumes or the set decoration? My mom has been on a bit of a minimalism kick lately and has been clearing out a lot of her storage. Almost every time I talk to her she's cleaning out some closet shelf or dresser drawer- it's impressive. It's also been really fun for me and my sisters because she'll have a cleaning spree and then send us a group text with pictures of things she's giving away. It's a bit like an auction, seeing who can claim things the fastest or who's holding out for the big ticket items. The best part is that I now have boxes of beautiful treasures, from actual antiques to shabby chic Home Goods finds, waiting for me to bring home. My mom's style is very feminine and she has a great eye for charming vintage details, and I think that vibe is just perfect for summer. The natural, more rustic elements feel laid-back and simple while the vintage touches provide romance and a little glamour. Here are some of my favorite finds for incorporating this style into your home decor or your personal wardrobe. Where do you like the vintage summer boho style best: your home or your wardrobe? Call it a moody May, but I've been really inspired by dramatic inky black interiors lately. I love how a coat of black paint can make something worn look chic, hide imperfections, and really make the interesting lines in a vintage or sculptural piece sing. Whether fully committing to a room with black walls or just adding a graphic impact in a mostly white room, one thing's for sure, black is always a good choice. Would you paint a room black? 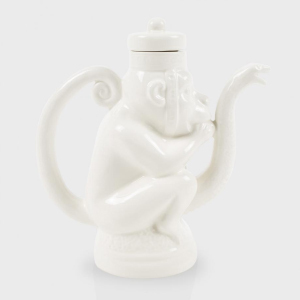 Hey, Hey, It's the (Year of the) Monkeys! This past Monday marked the Chinese New Year/Lunar New Year, making it officially the Year of the Monkey. 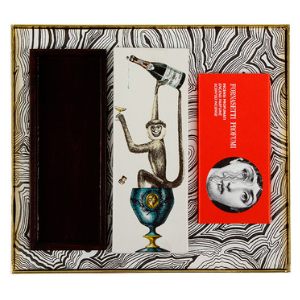 If your birth year coincides with the monkey, you are thought to be intelligent, clever, and one of the most innovative personalities within the Chinese zodiac. Those are traits of the monkey personality but, since it's the Year of the Monkey, they are also the overall theme of the year. According to tradition, that means 2016 will be an energetic and auspicious year full of reinvention for all of the zodiac signs. 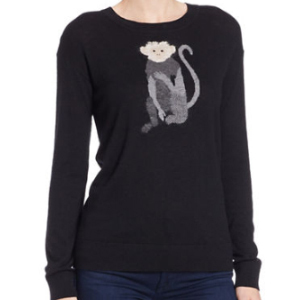 To celebrate, I've rounded up some of my favorite designer items featuring this year's monkey motif. Girrrrrrl, what's your Chinese zodiac sign? With just one week until Valentine's Day, love is definitely in the air. But I really appreciate love-themed design all year round, don't you? I mean is their really a time when a graphic heart motif or a cheeky love print is not welcome? I don't think so. Check out a few of my favorite love-themed items and then keep reading for a dude-approved playlist perfect for a V-Day dinner night in! You can listen to and follow this playlist, along with all the monthly mixes and my work/create playlist, via Spotify. See anything here you love? Let's talk it out in the comments! A fashion-meets-interiors celebration of Pantone's colors of the year, Rose Quartz and Serenity. The more I take a look at these two hues, the more I'm loving them. To me, they are a perfect blend of uplifting, energizing freshness and peaceful calm. It's basically yoga for your eyeballs. Are you loving these colors yet? Would you incorporate them into your home or wardrobe? Come back tomorrow for a quick and easy Rose Quartz and Serenity gradient mani! Ever since these gorgeous credenzas from DENY caught my eye, I haven't been able to shake the idea of having one for my dining room. If I had an spare $799 (a pretty reasonable price) in the budget, I would have one heading my way in a heartbeat. But for me and my personal finances, this is definitely not making the list of "must buys" anytime in the near future. Especially when I can see so many great cost-cutting DIY possibilities! Using a thrifted sideboard or a basic IKEA piece and a little ingenuity, you could pretty easily replicate some of these looks in your space for half the cost- or even less! I'll definitely be keeping an eye out for a frugal, DIY-able piece because I am crazy about the first look- the graphic word art. I also love the photo transfer idea (which by the way, would use a photocopy as opposed to an actual photo or anything with a high gloss finish). Wouldn't it be a wonderful way to use a vacation pic? It's a perfect blend of sentiment and good design. Which style is your favorite? Would you give any of these DIYs a go? My favorite thing about the 70s trend explosion as of late is that there are so many styles to choose from that all fall under the same retro umbrella. Just check out the last two seasons of Mad Men and you'll see what I mean. The style differences between the New York and LA sets alone are so distinct, giving off completely different vibes in each place. For instance, when I think of East Coast retro style, I picture a graphic, structured look. This downtown aesthetic in general can be described as crisper and more polished than its Western counterpart. Here's my take on the 70s trend, East Coast style, for both your home and and your wardrobe. West Coast style, to me, is the other extreme. Instead of sharp and bold, this look is all about being relaxed and free. It's at once both more casual and more glamorous. Here are a few of my favorite 70s-inspired West Coast finds. My personal style is definitely more on the West Coast side. I'm a sucker for all things velvet and/or gold and I love a good flowing fabric. What about you? Do you rock the 70s trend in your home or wardrobe? Are you an East or West Coaster when it comes to style? After moving recently, I noticed our key rings are now stacked with a whole lot of plain metal keys. Not exactly a visual treat. So I decided to use tape and nail polish to give them a quick pop of color and help them stand out from one another. To give your own keys a 5-minute upgrade all you need is Scotch tape and some nail polish! First, tape off sections of your keys, leaving an exposed shape to be painted. Give the exposed areas a couple of coats of nail polish. I used neon colors but I think black and white would also look really cool! You can see here that some polishes will need more coats than others. The lime green, for instance, took several while the fuchsia had good coverage with just one coat. Remove the tape before the paint is completely dry. This will prevent the tape from peeling part of the design off. Voila! A little pop of DIY color always makes me happy. For me, it's always the more color the better. But if you're a little more gun-shy when it comes to bold color statements, wallpaper can actually offer a great solution. You can use it more conservatively by applying it to only one accent wall or a very small area, like a hallway. Or, you can use it to add a pop to areas like a kitchen island or the back of a bookshelf. 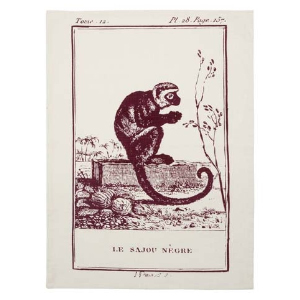 I can't get enough of these whimsical trompe l'oiel prints. The 3-D appearances add depth and interest- sometimes even impersonating architecture- to walls that are lacking (re: my boring rental walls), without the cost of major home renovations. I mean, can you believe that faux brick?! Whether whimsical or sophisticated, modern or classical, wallpaper prints are a perfect way to add major personality to a room's design. Plus, they brings loads of visual interest. Bring on the metallics! There's nothing like a touch of silver or gold to add some serious glamour to your walls. Aren't these gorgeous?! What's your vote on wallpaper? Love it or leave it? There's nothing like spring: romantic florals, fresh pastels, watercolor prints. All of these pretty, fresh design options really give a burst of energy after a long winter. Here are some of my favorites, including a gorgeous Tory Burch Fitbit design and a new "mini" sidekick to the Whitney English Day Designer. What's on your wishlist for Spring? I have been talking about making over my "office" for such a long time. Office is in quotes because by office I really mean the 4 feet of space in my living room where my computer lives. And when I tell you this space needs a makeover, I really mean it. The irony (and possibly hypocracy) involved in writing about style and great design from a space whose style can best be described as "boy's dorm room junk" is becoming too much to take. You see I'm plagued by a serious disease (please hear the over-dramatic undertone in this post). It's basically whatever the opposite of hoarding is... which, btw, I just googled this second and it is apparently called Spartanism. Who knew? Anyway, when I moved in with my fiance I got rid of way too many things. I was just planning to get new pieces, and by planning, I mean being delusional about the budget required to refurnish your home. So anyway, here I am, blogging from a peeled paint desk circa 1972 with a missing knob that was literally being thrown out when my fiance adopted it. Consider it among its supporting cast, his actual dorm room rug and chair from way too long ago, and we've got a much needed makeover on our hands! I threw this little mock up together on Photoshop. And really, even if you don't use Photoshop at all, I would totally recommend this method (even cutting things out of a magazine) for deciding on a room design. I was having such a hard time picking a color scheme, an era, etc. I was feeling the pressure for it to be cohesive, but once I just threw all the things I liked together, with no intention of matching or being "designed," I found that I really liked the end product. I'll be updating you with progress posts over the next several weeks, so stay tuned! And local friends, if you have any supplies/tools/skills you would like to donate to the cause, I will welcome it all with open arms. This post is part of a new series that combines two of my favorite things ever, fashion and interiors. Fun fact: I love them both so much (and just great design in general) that I couldn't decide which one to major in during college and ended up getting a separate degree in each. So this new series is kind of an ode to the knowledge gained from my very expensive indecision. (So, see, it did have a purpose, mom and dad. ;) ) Does anyone remember that show Dress my Nest with Thom Filicia from Queer Eye for the Straight Guy? Thom would rock my world by taking a girl's favorite outfit and then turning it into a beautiful room where the chandelier would represent her favorite dangling earrings, and so on and so forth. I LOVED that show. I wish there were new episodes for me to watch over breakfast every single day of my life. Another big inspiration for his series are the This or That posts on one of my favorite blogs, Elements of Style. They also combine fashion and interiors, showing the design similarities and current trends. So I wanted to steal borrow from both ideas and bring them together into my own version of the fashion/interior fusion. What trend would you like to see for the next installment of Dress Your Nest? Are you feeling the mystical vibe this month? And I want to say a quick thank you to the people who have followed along with this series. I love seeing your likes and comments and really appreciate the support! I hope you've gotten some good ideas over the past couple of weeks and wish you a very happy holiday! So what do you think? Any of these gifts melting your face off? Shout it out in the comments! And stay tuned, because I'm hitting you with a double dose of gift guides today. I've got a glam party-packed list coming soon! I really love those cocktail napkins! What about you? Any favorites? And don't give up on me just yet! I'll be tying up the 12 days with a gift guide for the music lover and the party animal, which will be loaded with NYE inspiration. Coming soon to a blog near you! And maybe you've got some classic prepsters on your list with absolutely no idea of what get for them? Well hold tight, ol' sport! Tomorrow I've got you covered.